What are the expectations for women? Are things different for men and women? It's no longer about health, but thinness. And losing weight and getting smaller has become a contest of who can lose more, at whatever cost to our health. Then thinness no longer represents robust health. Beauty is no longer aligned with health. No matter how much you lose, the distance from your goal still somehow remains the same. Recently Rachel Frederickson won Biggest Loser season 15. 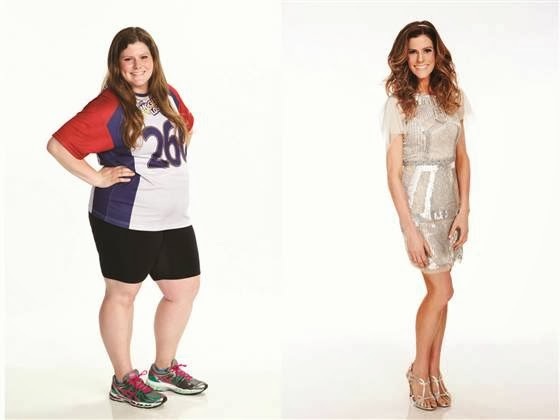 She lost 60% of her body weight and went from 260 pounds on day 1 on the Biggest Loser ranch to 105 pounds in a relatively short amount of time. She didn't lose 105 pounds, she is 105 pounds. She did this in a controlled environment with careful monitoring, and medical staff always off camera. The warnings and the amount of medical personnel and monitoring needed implies the risks and dangers associated with this program. What happens when regular Americans try this? So what are the messages women receive daily? 1950's: Mannequins were designed around average women, their customer base. The average hip measurement for women and mannequins were 34 inches. 1990's: The average hip measurement for women had grown to 37 inches while the average mannequin's shrunk to 31 inches. No longer designed around actual size but on expectations. The average US women is 5'4 and 166 pounds. The average US model is 5'11 and 117 pounds. Most runway models meet the BMI (Body Mass Index) criteria for anorexia. 10 years ago, plus sized models averaged between size 12 and 18. Today the average plus sized models are between 6 and 14. 50% of commercials aimed at girls spoke about physical attractiveness. 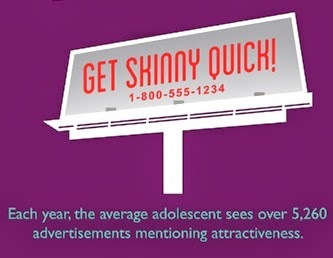 Each year the average adolescent sees over 5,260 advertisements mentioning attractiveness. 69% of girls in one study said that magazine models influence their idea of the perfect body shape. 47% of girls in the 5th-12th grade felt magazine pictures influenced them to want to lose weight. Only 29% of the girls in the study were actually overweight. 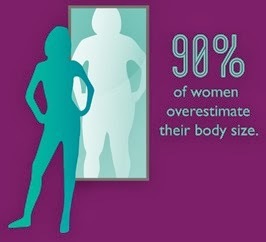 90% of women overestimate their body size. 4 out of 5 women are dissatisfied with their appearance. Over 10 million women and over a million men have eating disorders. 80% of women who answered a People magazine survey responded that images of women in television and movies make them feel insecure. Marilyn Monroe has become a symbol of "voluptuous" beauty, buxom blonde, "thick," real women have curves, and the idea that classic beauty is sort of chubby. Actress and model Elizabeth Hurley stated, “I’ve always thought Marilyn Monroe looked fabulous, but I’d kill myself if I was that fat…"
She's become the face of fat and fabulous, but we've become so distorted, we actually believe someone this thin is fat. So if Marilyn Monroe is "acceptable" fat, what is unacceptable fat? And if she's considered fat, how thin do you have to be to actually be thin? Movements using Marilyn Monroe as their poster child for "real" beauty is doing as much harm as every other advertisement. Today the Biggest Loser is the top rated show regarding weight and obesity and has become the face of weight loss. It's been endorsed by many health agencies and it's diet has been ranked in the top 10 by US News and World Report. Millions of people get inspired, follow the methods, mimic the work outs, and post their own before and after pictures. This show took before and after pictures to a whole other level. It also offers hundreds of thousands of dollars in cash prizes in a contest to see who can lose the most weight (not who can become the healthiest or fittest). It's a game show. Almost like an eating contest in reverse. Rachel Frederickson set a record for highest percentage of weight lost in the show's history. But her thin frail frame looks anything but robust and fit. This isn't an attack on Rachel, it's a contest with lots of money involved and the idea is to win at losing weight. She played by the rules and won. And the look on Bob Harper and Jillian Michaels says it all. To what they've been promoting all along. As if they they finally see with eyes unclouded.